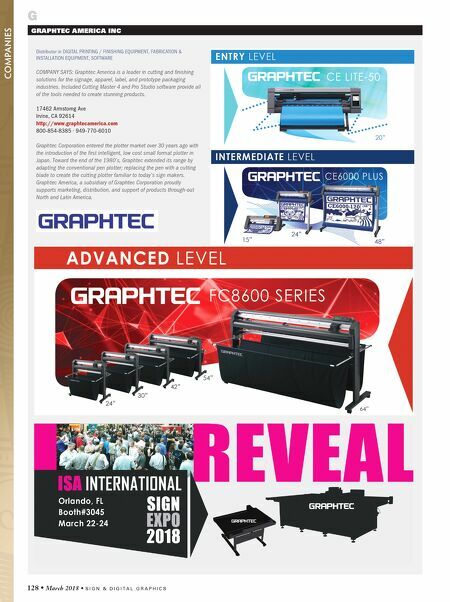 128 • March 2018 • S I G N & D I G I T A L G R A P H I C S G COMPANIES GRAPHTEC AMERICA INC Distributor in DIGITAL PRINTING / FINISHING EQUIPMENT, FABRICATION & INSTALLATION EQUIPMENT, SOFTWARE COMPANY SAYS: Graphtec America is a leader in cutting and finishing solutions for the signage, apparel, label, and prototype packaging industries. 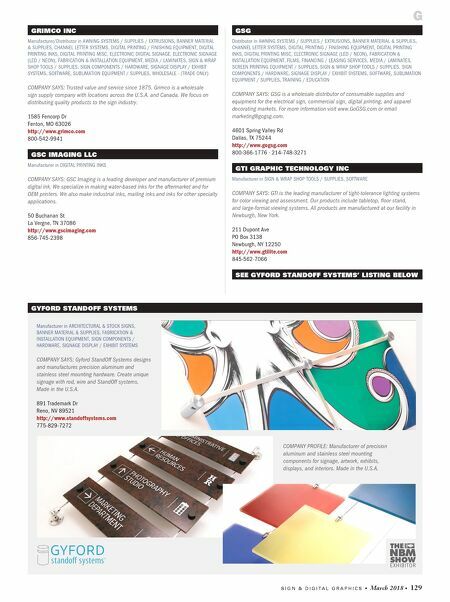 Included Cutting Master 4 and Pro Studio software provide all of the tools needed to create stunning products. 17462 Armstorng Ave Irvine, CA 92614 http://www.graphtecamerica.com 800-854-8385 ∙ 949-770-6010 Graphtec Corporation entered the plotter market over 30 years ago with the introduction of the first intelligent, low cost small format plotter in Japan. Toward the end of the 1980's, Graphtec extended its range by adapting the conventional pen plotter; replacing the pen with a cutting blade to create the cutting plotter familiar to today's sign makers. Graphtec America, a subsidiary of Graphtec Corporation proudly supports marketing, distribution, and support of products through-out North and Latin America.